We received a treat from Montana Public Radio, this morning, when I happened to turn on the radio, while making the morning muffins. At 8:00 AM, Mountain Time, every Saturday is a program called "Children's Corner", where stories are read for children by the librarians from across Montana, and every other week Dr. Katie visits, with a "Science is Cool" segment. Today's broadcast was filled with Chanukah stories, and music, and was a nice surprise. Unfortunately, it doesn't look to me like you can catch the broadcast after it airs live, so I can't pass on a link to the stories we heard today, but next week at 8:00 AM, Mountain Time, you can tune in live, on your computer, by clicking the link, here, for a fun story time. In the meantime, I have a link to a Chanukah story, you can enjoy today. After, our laktes (is the singular - latke, or is it always latkes?) 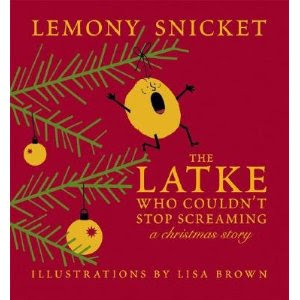 post, we got a comment suggesting we check out the Lemony Snicket story The Latke Who Couldn't Stop Screaming, A Christmas Story, which we did, and really enjoyed. We also found it being read, here, on YouTube. So, if you can't get your hands on it, you can check it out there. 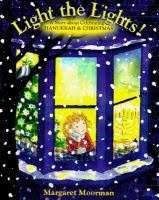 It's a funny, but thought provoking story, about giving Chanukah a place of it's own, separate from Christmas. In it, a latke runs screaming into the night, trying to explain himself, and the history of Chanukah, to all the Christmas decorations, who do their best to include him in their celebration. After all, a tasty little hash brown, might go nicely with the Christmas ham. However, if you are a family that celebrates both Chanukah, and Christmas, side by side, you might enjoy Margaret Moorman's Light the Lights! A Story about Celebrating Hanukkah & Christmas. Moorman wrote the book, according to the note on the flap, after searching in vain for a story that reflected both celebrations. It does take kind of a secular approach to the holidays, though it leaves room to expand the discussion into the faiths behind them. For more children's story reviews, and recommendations, don't forget to check out this week's What My Child Is Reading link-up, at Mouse Grows, Mouse Learns. Thanks for the links! I will definitely check out all of them. I think it is very cool that you have that great radio programming! I wonder if we have anything like that around here. hey..I linked to you in my most recent blog post! check it out! I so am checking out these books, especially the link. Hee hee, the captcha looks vaguely Hebrewish. OK, next year I have to look for Latke that Couldn't Stop Screaming. We do "an ornament of a day" coloring from Activity Village Advent Calendar, and Anna keeps calling round ornaments latkes. We read Light the Lights, but I found it a little... cold - like neither holiday was really explained, and it's all about decorations. I am definitely going to look for these books next year. That sounds like a wonderful radio station you have. I can get stations similar to that in my car, of course it is satellite radio, but as far as stations I can get in my house Forget It!